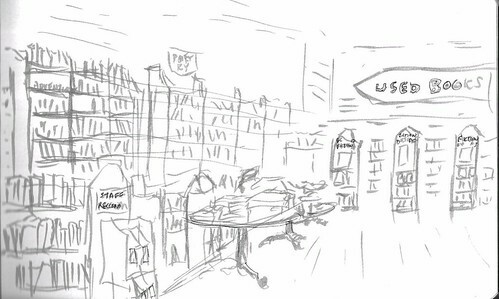 Another wonderful day with sketchers, new faces and familiar, and wonderful sketchbooks to admire. This was a great place; we could have spent the whole day since there were distractions (cafe, books) as well as lots to draw. We even drew outside, as the weather gave us a break! 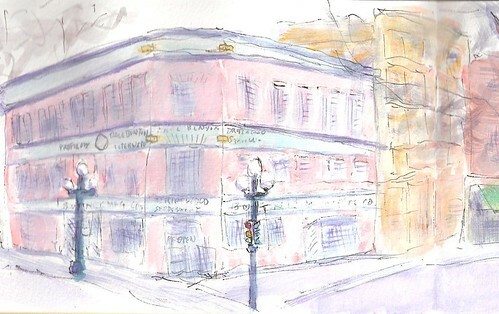 Here is my sketch at First and Washington, a block north of the bookstore: my first attempt at using gouache. Hmmm... I liked the fading painted signs on this brick building which, I guess, was a factory for Paul Bunyon and Driftwood Sportswear. Now it sells carpets and other delicacies.